This kagamijishi is based on traditional Kagami Jishi ningyo dolls which in turn are based on the folktale and kabuki tradition of “Shunkyo Kagami Jishi” in which an Edo period young lady-in-waiting named Yayoi residing in the Edo palace, was picked to perform a Lion Dance for the shogun at the New Years’ Day Parade. The Lion Dance is a tradition originating from China which is believed to drive away evil spirits with the strength of a lion, but in the tale, the lion spirit that resides inside the mask, possesses the timid character of the palace maid Yayoi when she begins to dance with the wooden shishi (lion) mask. 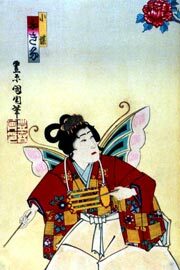 The Nagauta-based dance “Shunkyô Kagami Jishi” premiered in March 1893 at the Kabukiza. 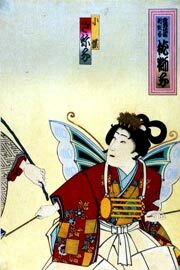 Ichikawa Danjûrô IX (middle) and his two daughters Fukiko (left) and Sayako (right) playing the role of the spirit of the shishi and the two butterflies in the dance “Shunkyô Kagami Jishi”, which was staged in March 1893 at the Kabukiza (print made by Toyohara Kunichika) This Nagauta Buyo was first performed by Ichikawa Danjuro 9th in the Meiji period. 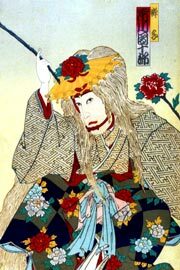 In Kagamijishi – ‘The Lion Dance’ – Tamasaburo Bando displays his extraordinary versatility in this most demanding of roles; first as a shy maiden and then as a fierce lion. In Kagamijishi the court lady Yayoi is dancing at New Year celebrations when a lion head mask lying nearby begins to distract her. Completely captivated, Yayoi moves to pick up the lion mask. Once in her hand this lion mask takes possession of her soul and her dance suddenly becomes erratic. The spirit of the mask overpowers her and drags her off-stage. Moments later, Yayoi rushes back down stage, now fully transformed as a huge lion. Two butterflies irritate the lion into a frenzy; he dances, swirling his great mane in wild circles, evoking the fearsome rage of a lion. The most interesting point of this dance is how to act the two different personalities of Yayoi-a young lady, and the witch of Rion…a technique requiring the skilled role of the onnagata (John Fiorillo), The Mask completely possesses Yayoi, who is transformed into the personality of the witch of Rion (Masako), and so she dance boldly, without any hesitation. After the dance performance, Rion is satiatied and releases Yayoi. Although in the Kagami jishi stories, the spirit residing in the mask is supposed to be an evil one, lions were originally guardian spirits, and the role of lion dancing a protective one, its function was to repel evil spirits. This change in idea of where evil resided may reflect the historical opposition and tussle over time in evolving religious traditions of Taoist-magic/spiritism derived ideas and Buddhist ones. 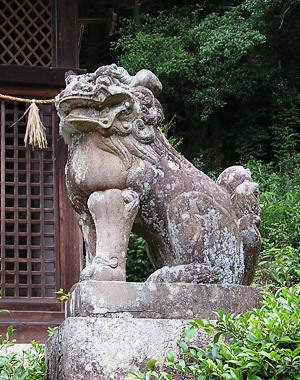 “This mythical beast was probably introduced to Japan from China via Korea in the 7th or 8th century AD, during the same period as Buddhism’s transmission to Japan, for the Japanese shishi combines elements of both the Korean “Koma-inu” (Korean dog) and Chinese “Kara-shishi” (Chinese lion). One prominent theory holds that the shishi derives from the Chinese Foo Dog (see LEARN MORE below for more). Lions, by the way, are not indigenous to Japan, China or Korea, and supposedly entered those nations in the form of imported art and sculpture, with the earliest traces of the animal appearing in China’s Han Dynasty (about 208 BC to 221 AD)…. …the shishi-mai or lion dance is often seen at shrine festivals and at New Year’s, when performers visit each home in the neighborhood to cast charms against evil spirits and diseases while receiving offerings. A shishi-gashira, or lion’s head, is the headdress worn by the performers. The shishi-gashira, moreover, is traditionally placed near a newborn baby boy because the lion’s magic is believed to protect the boy from evil spirits and misfortune. Today there are still many skilled craftsmen making shishi-gashira. Lit. ‘Korean dog’. A pair of lion-like guardian figures placed at each side of a shrine or temple entrance; believed to ward off evil spirits. Thought to have been brought to Japan from China via Korea, their name is derived from Koma 高麗, the Japanese term for the Korean kingdom of Koguryo 高句麗. In the early Heian period (9c) the two statues were clearly distinguished: the figure on the left, called shishi 獅子 (lion), resembled a lion with its mouth open *agyou 阿形; the figure on the right, called komainu 狛犬 (Korean dog), resembled a dog with its mouth closed ungyou 吽形, and sometimes had a horn on its head. Gradually the term komainu came to be used for both statues, and their shapes became indistinguishable except for the open and closed mouths *a-un 阿吽. In the Heian period (9-12c) komainu were used as weights or door-stops for curtains and screens in the Seiryouden 清涼殿, Kyoto Gosho 京都御所. Other famous examples include a pair of painted wooden komainu (10-11c) at Yakushiji 薬師寺, Nara; 14 painted and lacquered wooden figures at Itsukushima Jinja 厳島神社,(12-14c) Hiroshima prefecture, and the stone figures inside the south gate of Toudaiji 東大寺, Nara, made by the 12c Chinese sculptor Chinnakei 陳和卿. The first type, born during the Edo period, is called sandō komainu (参道狛犬 visiting road Korean dogs? ), the second and much older type jinnai komainu (陣内狛犬 shrine inside komainu?). They can sometimes be found also at Buddhist temples, nobility residences or even private homes. …Meant to ward off evil spirits, modern komainu statues are almost identical, but one has the mouth open, the other closed. This is a very common characteristic in religious statue pairs at both temples and shrines. This pattern is however Buddhist in origin (see the article about the Niō, human-form guardians of Buddhist temples) and has a symbolic meaning. The open mouth is pronouncing the first letter of the Sanskrit alphabet, which is pronounced “a”, while the closed one is uttering the last letter, which is pronounced “um”, to represent the beginning and the end of all things. Together they form the sound Aum, a syllable sacred in several religions like Hinduism, Buddhism, and Jainism.